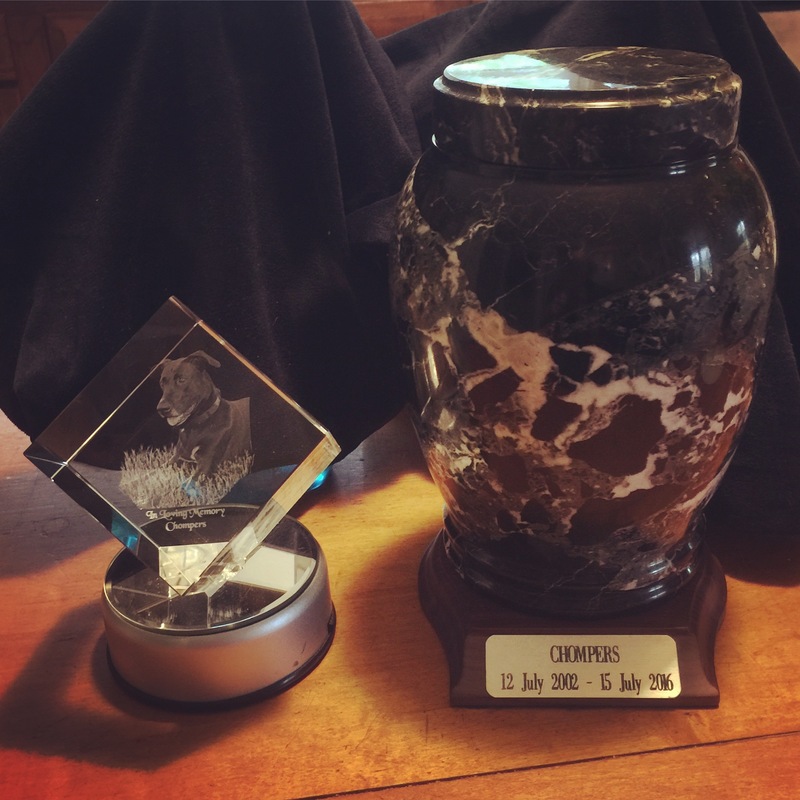 For those of you who have followed my blog, (first let me thank you for hanging with me and my paltry writing skills) you know a little bit about The Run for the Animals and how much it means to me. 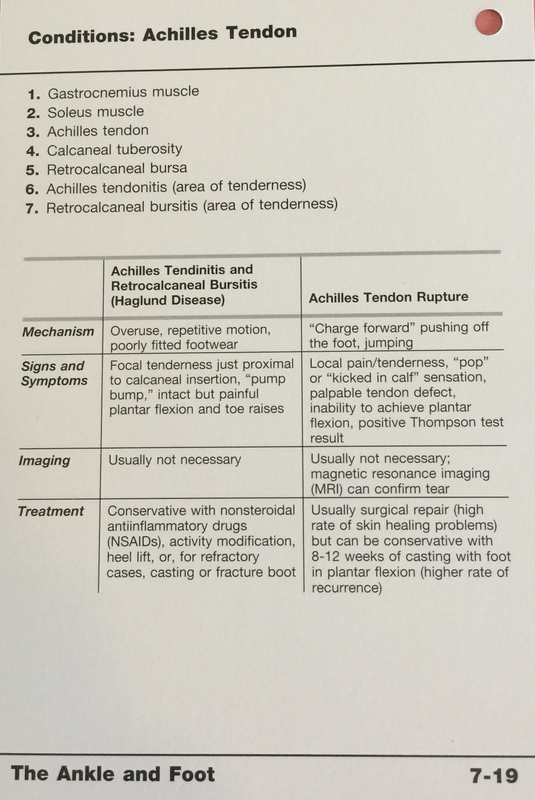 If you’re a little behind you can check out this post. Today was the 5th Anniversary of the race and I did partake yet again, and will every year for as long as I can help it. I ran the half marathon today. I PR’d by under a minute from last year’s half! Hey, any improvement is still an improvement. I’ll take it! And I finished first in my age group. But that is not what made today’s run extra special for me. The inaugural Run for the Animals was my very first race after I decided to take up running to get healthy and fit. So that makes today my 5 year “RACE”iversary! I will toot my own horn and pat myself on my own back to congratulate me for sticking with it, even when things got tough. I finally followed through with something and plan to keep up with it for as long as my body will allow. This is not to say that there aren’t others responsible for where I am today, because all of those times when I wanted to throw in the towel they were there to keep me motivated and to remind me of why I started running in the first place. They pushed me further than I ever thought I could go and stuck with me throughout the process. You all know who you are and I am forever grateful for each and every one of you! That is one thing that made today extra special. But there is so much more. Since running the Shamrock Marathon three weeks ago, I have not seen my marathon training buddies. All of them showed up today for the Run for the Animals. It was a great reunion with an amazing group of ladies. I’ve missed them so much! I ran the half marathon with my training buddy Sarah. The others did the 10K or the 5K. Sarah’s husband and oldest son ran the non-competitive 5K (a first run for both of them) and did an awesome job! If it was timed they would have gotten first and third overall. Jennifer ran the 10K with her two sons, a first 10K for one of them and the other placed in his age group! Awesome job Sage! Lisa and her dog Chessie ran in the 5K and did great! 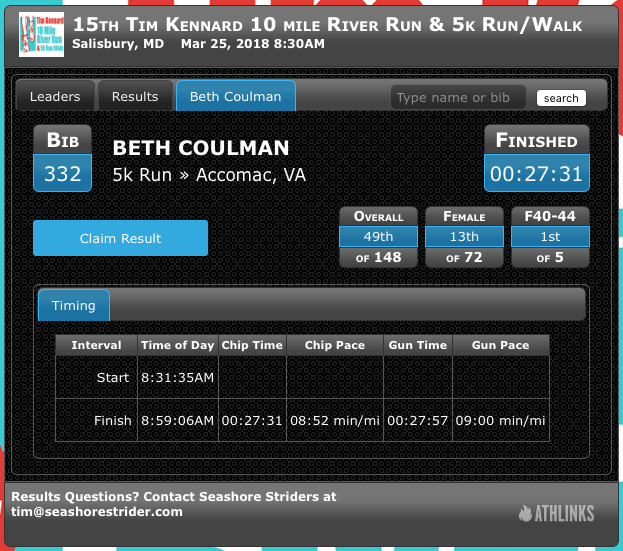 Becky and her dog Stark ran the 10K and placed in her age group. Everyone did a fantastic job! This was another extra special thing about today. Still more though. I have yet another running family. I attend a local boutique gym called Attitudes Fitness as often as I possibly can, and I teach a class there once a week called Pound. 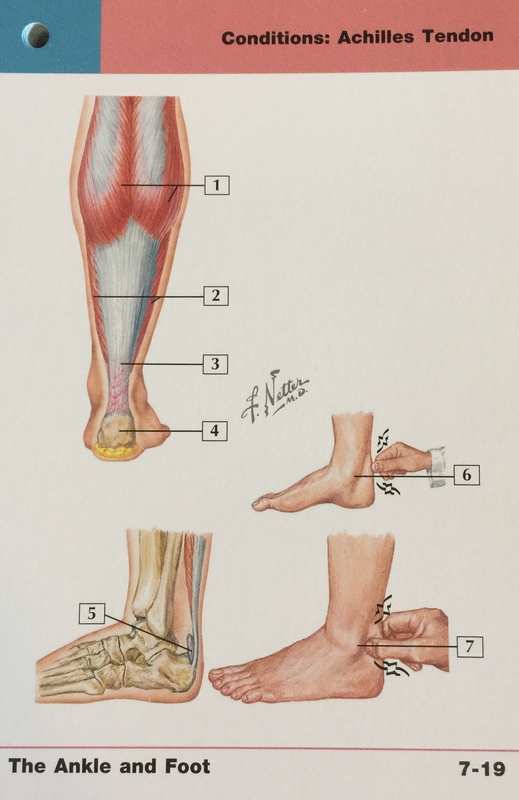 (You can learn more about how that happened here.) I have met so many awesome ladies (and a few gents) during my time at Attitudes. Just over one year ago, Sheila, the owner and trainer-extraordinaire, decided to give running a try during one of her stays at her second home in Florida. She learned to enjoy it. Even after she said she would never be a runner! Sheila totally smoked her first 10K and earned first place in her age group! Jen and Jean are two awesome ladies that took up running and actually took part in the Run for the Animals last year. They both PR’d today! Liz is another instructor at Attitudes, is 7 months pregnant, and finished the 5K in just over 30 minutes! Then there’s another Liz, Liz W. Liz W. just started running with us about 6 months ago. She has been doing awesome. She signed up for the 10K a couple of months ago, but this morning had a bit of pre-race anxiety. She told me she just wanted to finish at a respectable time. She was hoping for a time of around 1:20:00. She finished in 1:04:??!!! Her first race, a 10K, and she smoked it! Patty is another one of those OMG amazing women. Patty is not new to running. She’s been running for a few years at least. She has overcome so many obstacles over the last few years and she is still out there with us every chance she gets! A cancer survivor, finished the Dirty Girl last year with 4 (or was it 5) broken ribs that happened during a collision on the first obstacle, then had a foot injury recently. This woman is my idol. She is one tough cookie and the most genuine spirit you could ever know. She is always there for support when she can’t run, but she’s always finding a way to get it done-No Excuses! I could go on for probably an entire blog post in and of itself about all of the amazing ladies (and few gents) from Attitudes, but I wanted to let these girls know just how proud I am of them and how much I love them. They are all RockStars! Today was extra special because I got to take part in all of these wonderful ladies’ victories! And yet there is still more. I have my running “families” which are those groups of friends that I run with on a somewhat regular basis, or those that I get crazy with and sign up for things that I wouldn’t normally do without their arm-twisting. Then I have my running friends; those friends who I only see during races or special events, but not on a regular basis due to scheduling differences or location. I was able to see several of my running friends today and that always makes me happy! One of them, Laura, won the overall female for the 10K last year and again this year. She improved on last year’s time by about 5 minutes! How awesome is that? I am so happy for her. She is an awesome lady and a badass too. 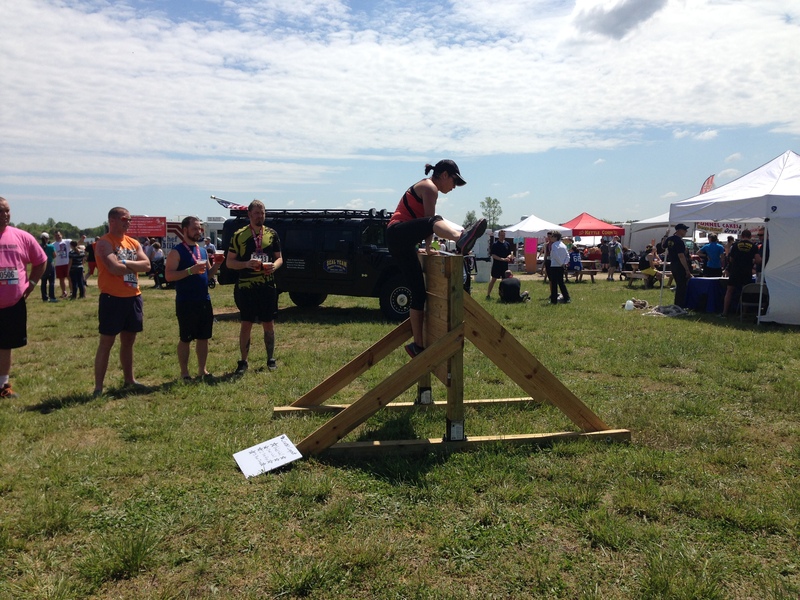 She completed the Spartan Trifecta last year and placed for her age group. She also leads a group fitness class and motivates and inspires people on a daily basis. I saw several other of my running friends and regret that I couldn’t catch up with everyone as much as I would have liked to. The Number One reason I enjoy running so much is all of the fantastic individuals I meet! Every year my running-friends list grows and I hope it continues for decades. Lastly, I am so thankful and grateful to the race director Andrea, all of the volunteers, sponsors and fundraisers. Andrea created this awesome event and it has grown by leaps and bounds in its 5 year history. The cause is something that I hold dear, and the venue is absolutely superb. This year they added a 5K non-competitive run/walk and had almost double the number of participants from last year’s event. That is amazing! My only regret is that I did not do any fundraising this year. I have every year in the past and have done rather well. This year there was just so much going on that I didn’t have the time to get it done. Thankfully everyone else stepped up to the plate and was able to raise a ton of money to help out our local needy animals! ALL of you fundraisers ROCK and deserve huge recognition for your efforts. And the volunteers. You are the backbone to the event. Without you it couldn’t go on. Thank you for all of your support and your hard work. 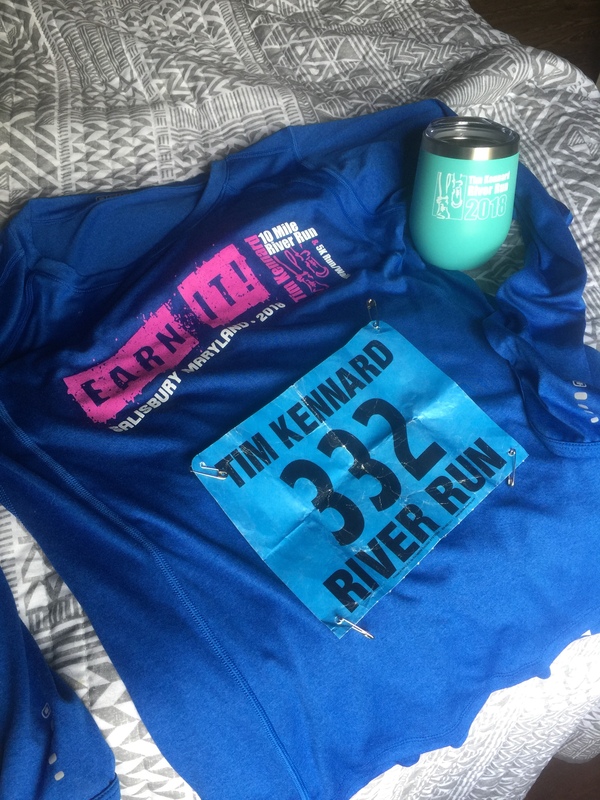 If you ever find yourself on the Eastern Shore of Virginia during your travels, consider taking part in the Run for the Animals if your travels happen during the event. It is always a wonderful time, supports a great cause, has awesome race bling and you will meet a lot of awesome people. 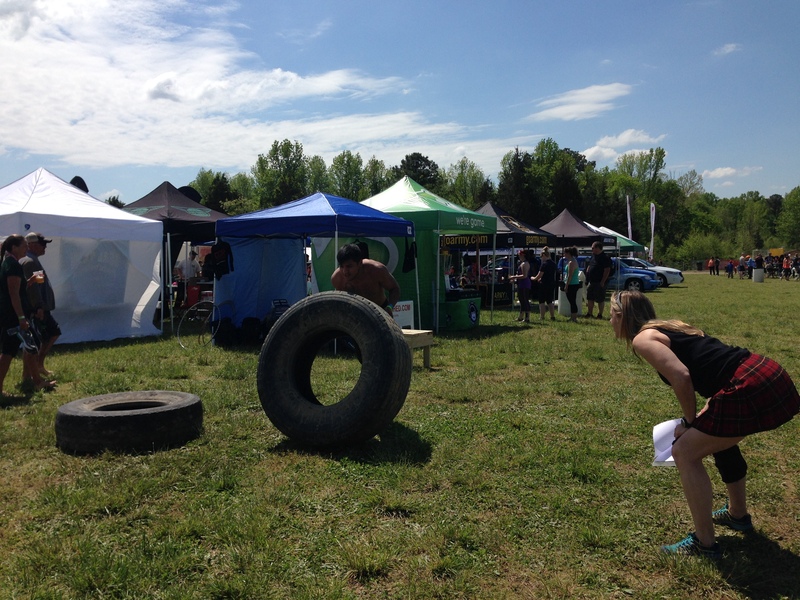 Saturday May 2nd, I along with several friends and acquaintances took part in the Rugged Maniac at the Virginia Motorsports Park in Petersburg. Speaking for myself, but certain that all of my team participants would agree, it was AWESOME! What a blast and what a great group of people (both my team members and all of the others who attended). 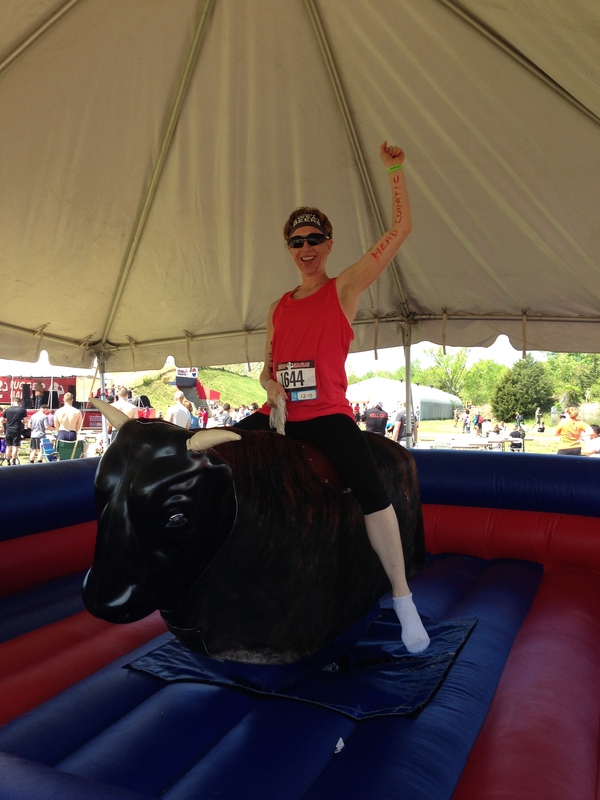 Ever since I did my first mud run in 2012 at Camp Ramblewood in Darlington, MD, I couldn’t wait to do another. It all started with the no-longer-in-existence Run For Your Lives, a 5K Obstacle Course Race where you had to escape zombies. It was an awesome time. Even though we had to swim across a freezing cold river in late October, I’d have still chosen to do it all over again. And there were zombies. Fun! What an awesome feeling of accomplishment it was to make it through all of the obstacles that I never thought I’d ever be able to do! Like crossing a freezing river in October. Had I known that was one of the obstacles beforehand, I probably would have never signed up to take part in the event. Smart move there race directors at Reed Street Productions. Not because of my disappointment with the 2nd RFYL, I didn’t do any more mud runs until last weekend. 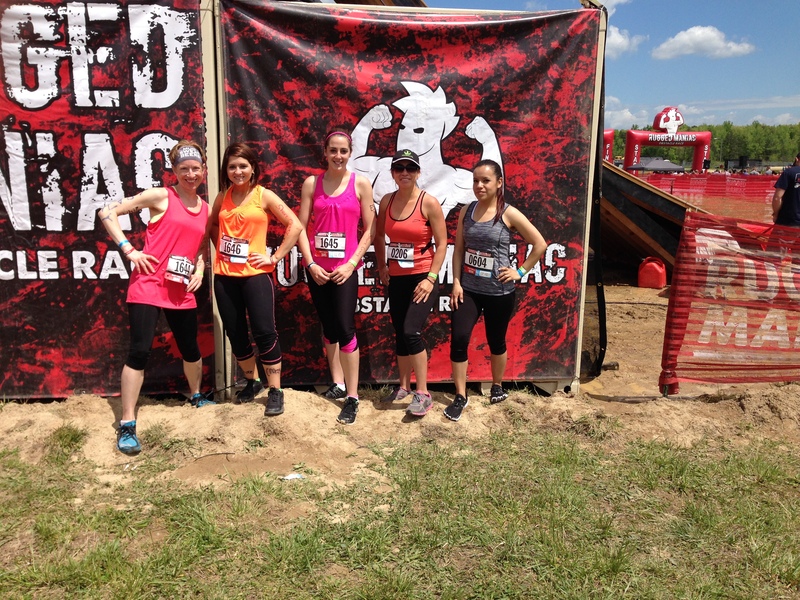 There just weren’t any convenient ones for me that I could get time off for; at least none that made me go “I have to do this.” Then the Rugged Maniac ads started to fill my email and social media feeds. I can do that. It’s relatively nearby, and I had plenty of notice to ensure I would be available that weekend! So I put some feelers out to see if anyone else was interested in joining me, because a mud run is SO MUCH more fun with a group than solo. The fish started biting almost immediately. So we signed up. Over the course of a couple of months our team grew to a total of 11. I knew this was going to be one hell of a fun weekend! And I was right. The majority of the team drove to a nearby town the night before. A few of them carpooled with me. We made a weekend out of the event; why not? By doing this we didn’t have to worry about traffic, especially at the Hampton Roads Bridge Tunnel, which could have delayed us if we left the day of the event. That HRBT is a bear sometimes. Not a soft, cuddly teddy bear; a grumpy, nasty, mean Grizzly Bear. Sometimes traffic moves like a hibernating bear. 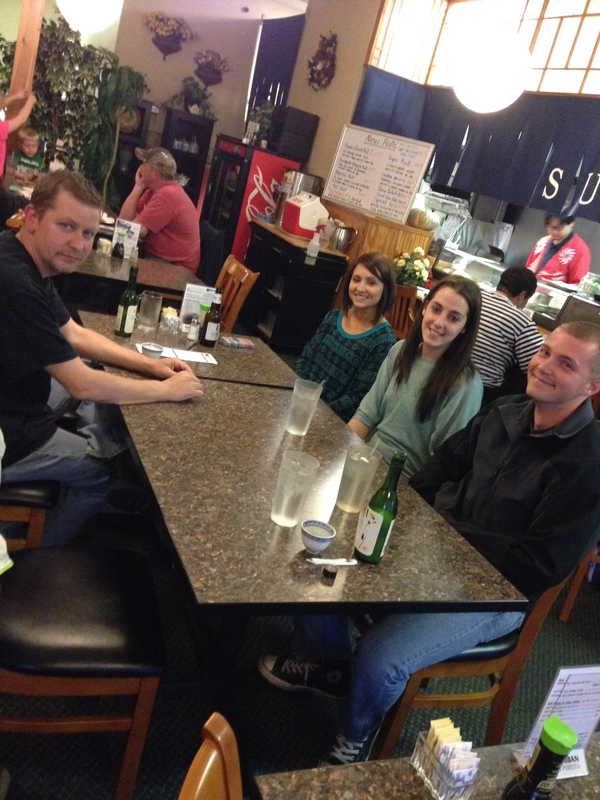 We arrived at our hotel unscathed and went out to dinner at a mediocre sushi restaurant. At least the Nigori Sake was good (a little too good as I may have had a bit too much of it). After dinner we returned to the hotel rooms and had fun playing Cards Against Humanity (we are horrible people!) and drinking beer. I don’t really remember exactly how the night ended, I just woke up the next morning bright and early and ready to get muddy! Our wave time was 12:15PM, so we headed over to the event site around 9:45AM as it was a 20 minute drive from the hotel. We arrived just in time to see some parachuters landing. That was pretty cool. After checking in and getting our race gear we perused the event grounds to see what was happening! There was a mechanical bull that we just HAD to try. So we did. That was fun. There was a beer tent (yay!) and several food vendors that were serving anything from greek sandwiches to funnel cakes. I steered clear of all of that stuff. If I’m going to have something that’s going to make my guts sour, I’ll stick to the beer. They have bananas and other fruits post race, and I snuck a bagel and a banana from the continental breakfast offered at the hotel before we left. Always thinking ahead (or at least TRYING to be prepared!). There were some other gym/fitness tents but, unfortunately for us ESVA folks, they’re not anywhere local enough for us. But I did chat with a few of them to see what they offered, to encourage them to bring POUND to their gyms (because it’s awesome), and to try to talk them into coming to the shore! We’ll see how much influence I had on them. I’m sure it wasn’t much. 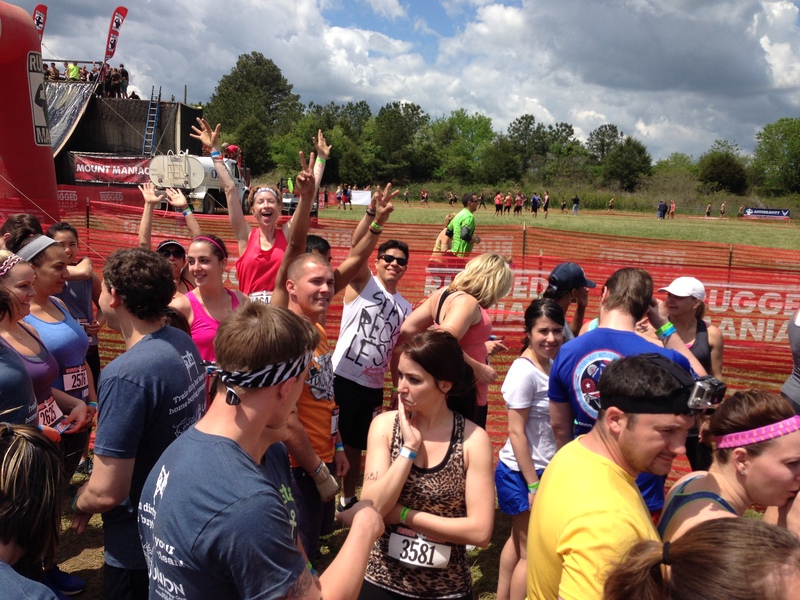 There was this one awesome group there called OCR Unleashed. 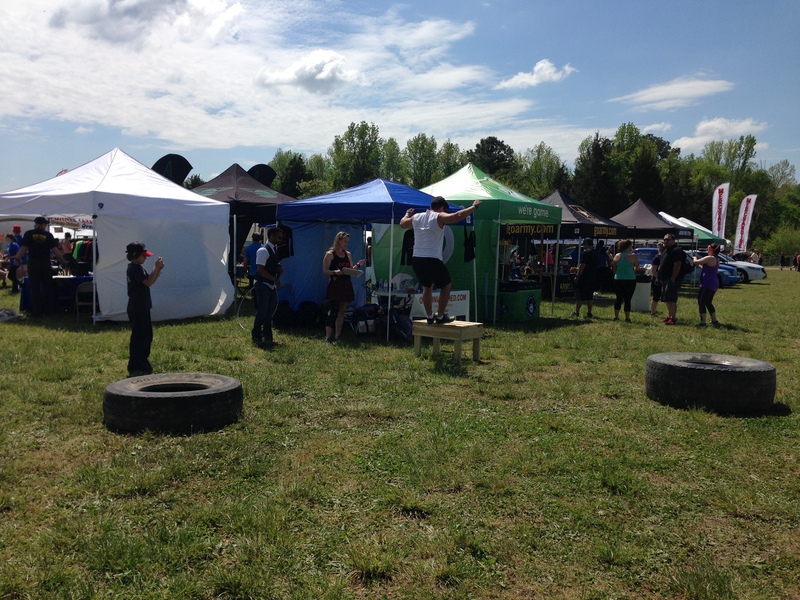 They had a mini obstacle course set up that consisted of crawling, leaping, lifting huge tires and box jumping. After talking to the gal at the tent I convinced my team to “warm up” here. It was GREAT FUN! It reminded me of CrossFit, which doesn’t exist on the shore but I really wish it did. If there were a place convenient for me to get trained, I’d do it and bring it here. But there’s not. So I’ll continue to dream. 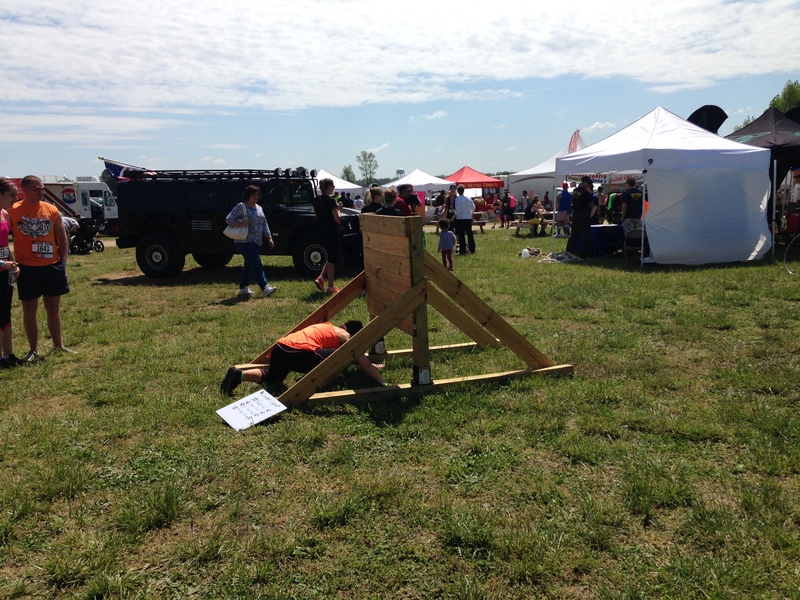 Back to OCR Unleashed…the mini obstacle course was a blast and I learned that they have an Obstacle Course facility in Great Falls, VA that I WILL visit one day in the near future. The folks involved with the group are just totally cool, even the ones I haven’t met are cool. Trust me, I know people. Check them out and if you are in the area, visit the facility! Just don’t rub it in about how awesome it is because that will make me feel sad. Not really, it will encourage me to get out there that much quicker actually, so tell me all about it!!! After our warm-up we took a group shot of all of us girls!